I had the pleasure this morning to fish with Cole and his younger sister Katelyn - fighting a 5 foot lemon shark pictured above - from Delray Beach, FL. Cole and Katelyn do quite a bit fishing are in Key West with their parents and other siblings for a few weeks of fun in the sun on the family boat. I met their father Martin the other day on the dock at Garrison Bight Marina and asked if I would take them out for some fishing. I was more than happy to oblige and we decided on some shark fishing. 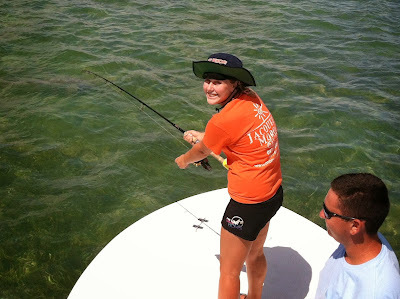 Shark fishing on the flats of Key West can be very exciting and sometimes downright simple. It's a great way to spend a day on the water with younger anglers, sharks are just awesome. Once we get them chummed up and a bit excited we can keep them next to the boat for hours. At one point we had 15 lemon sharks all 4-7 foot long next to the skiff trying to get to my chum bag full of stinky, bloody goodness. Katelyn and Cole each hooked and landed a couple of sharks before one them finally got his teeth on the chum bag. We had time to hook one more as all the bait floated away down the flat which fortunately was near the end of our trip.